The festival’s executive and artistic director discusses Thelonious Monk’s centennial, the Wall of Respect, and more. Up next in our series of interviews with notable, in-the-know locals: Kate Dumbleton, executive and artistic director of the Hyde Park Jazz Festival, which starts Saturday. A focal point of this year’s festival is Thelonious Monk’s centennial. How did you program that? There’s a lot of centennials this year for jazz heroes: Dizzy Gillespie, Ella Fitzgerald, Thelonious Monk. I decided to explore one of them in depth. Dee Alexander proposed a project called Monk and the Ladies, which is an all-women’s group playing Monk’s oeuvre, thinking about the vocal aspects of that. And I knew I wanted to bring in Robin Kelley—he’s written the definitive biography of Monk. I asked him to come give a talk about Monk at 100. In all, we’re doing four very different tacks on the work. There’s also “Listening to the Wall,” a panel discussion about the Wall of Respect, the Bronzeville mural of black leaders that was destroyed in 1971. How did that come about? Well, it’s the 50th anniversary of the Wall, which was a really important mural on the South Side. But it was more than a mural. It was a convening space for artists and the activist community there at that time. It was painted and repainted and then painted again—there was a lot of discourse about who should be on it [Martin Luther King, Jr., Nat Turner, Gwendolyn Brooks, Malcolm X, Muhammad Ali, and Aretha Franklin all appeared]. And people would just come out and perform in front of it—Beat poets, musicians. It ended up being this outdoor space celebrating the black community, and one constant on the mural was jazz figures. So, [SAIC professor] Romi Crawford put together “Listening to the Wall” a panel where she and some other folks will play music by the artists on the wall and talk about activism of the South Side. The festival’s venues are scattered throughout Hyde Park, rather than clustered in one spot. Why? 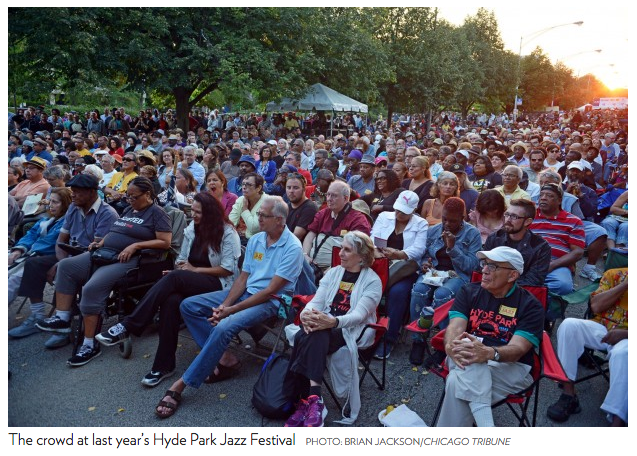 The founders of the fest had two original concepts: to highlight the architecture in Hyde Park, and to do so through jazz music, which has such a history on the South Side. It’s a fun element of programming the festival, because you have to think about what will sound good in what space. People can also move around from location to location and have very different types of experiences. They’re in a gallery for one show, then they go to the Midway for another show, then maybe they’re in the Hyde Park Bank for another show. If you had to pick a few performances to see, which would they be? Amina Claudine Myers in the Hyde Park Union Church will be extremely special. Andrew Cyrille and Bill McHenry at the International House. And Nicole Mitchell’s project that she’s creating with musicians from Mali that we brought all the way to Chicago. I’ve been at rehearsals this week, and it’s just beautiful. It’s going to be amazing.